British-Nigerian singer, actress and artist Patti Boulaye is to sing her autobiographical show at the Crazy Coqs from March 4-8. This bubbly, exuberant and frankly extraordinary force of nature, much better known for her West End work and huge projects e.g leading a 5,000 strong choir down Pall Mall in 2002 for the Queen’s Golden Jubilee, not to mention her major philanthropic works in her native Africa, is to sing in a small, intimate space with just a pianist for accompaniment. She pointed out that it also gave her a real instinct of how she was going to be received, whether the audience was going to be hard work or whether it was ‘party time’; experience which stood her in good stead when dealing with committees and groups with her charity work. Initially, Patti arrived in England at the age of 16 to talk to the Sisters in a convent about becoming a nun. Staying with her sister, who was often out at work, she was often alone and so went off sight-seeing. Heading for Madame Tussauds, she passed a long queue by St Giles and noticed a picture of a head with a lot of hair, similar to the then poster for Tussauds. She joined the queue, and a couple of hours later was at the Stage Door asking how much it was to get in. The Stage Door keeper explained it was an audition. She had never heard of one. He said she had to sing. So, she went in with a small group and sang from The Sound of Music ( ..well, she wanted to be a nun, didn’t she?). It turned out they were looking for a soprano to sing the Hari Krishna song and no sopranos were auditioning for Hair – they had been looking for two weeks, and she had the highest note. Her father, a strict Catholic, was appalled and disowned her for three years. I asked her if her faith informed the material she sang. So, what can we expect in the Crazy Coqs? 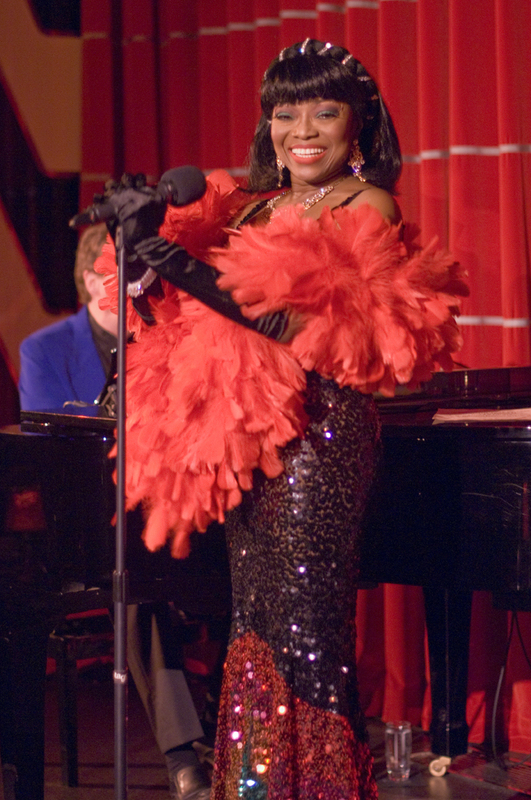 She will sing from shows she was in, including Carmen and The Black Mikado, as well as some less well known material close to her heart, including a racy song written by eighty four year old Alberta Hunter called “Rough and Ready Man” – looking forward to that! She will also introduce her daughter Aret Kapetanovic, who some will remember as a contestant on The Voice UK. It promises to be a fun show. Just seen the show and want to write a few words about it. This is Patti’s comeback after a fourteen year gap, when she concentrated on her charity work, building no less than five clinics and a school in Africa, and doing much to educate villagers about AIDS. Understandably, she was nervous about returning to the stage after such a long time away, but she needn’t have worried. Once she found her feet and got comfortable up there, her artistry and natural communicative abilities soon won us over. After the big sing numbers of ‘Habanera’ (Carmen Jones) and ‘The Sun Whose Rays’ (The Black Mikado), she gave us her unique interpretations of familiar numbers such as ‘Don’t Cry For Me Argentina’ and ‘Memory’, and I also very much liked the romantic ‘Sealed With A Kiss’. But for my money, it is the blues/soul numbers that set her apart from other singers. Here, it is almost as if she has discovered a new milieu for herself- very strong and affecting. There were saucy numbers laden with double-ententre, including the witty ‘Rough and Ready Man’, songs that could be her moto ‘Ain’t Nobody’s Business’ and the huge ‘My Way’, but the most raw and lacerating Etta James songs ‘I’d Rather Go Blind’ and ‘At Last’ caused the audience to erupt. Beautiful and talented daughter Aret was a great addition to the programme, singing ‘God Bless the Child’ with great musicality and performance presence. Charmingly, her five month old son was there to support her. A programme of musical variety, heart-felt soul and straight in your face glamour ( her frocks were stunning! ), this is a lovely evening. This entry was posted in Features - Theatre and Cabaret News and tagged Alberta Hunter, Aret Kapetanovic, Crazy Coqs, fiona jane weston, Patti Boulaye, The Voice UK. Bookmark the permalink.